I like to think that I’m part of a healthier generation of cooks. We read ingredient lists, we buy local produce, and we try new things to expand our palates. We cook with fresh ingredients and avoid the dreaded “middle aisles” of the grocery store where they sell all the processed food. I like to think that. And then I see food videos on Facebook for things like “Mom’s Easy Strawberry Cake” and all that goes out the window in the name of nostalgia. Cake mix? Jello? Powdered sugar? Bring it on. I love dessert. All the desserts. I especially love cakes. Which is exactly why I like to make them for parties where they will get eaten up! 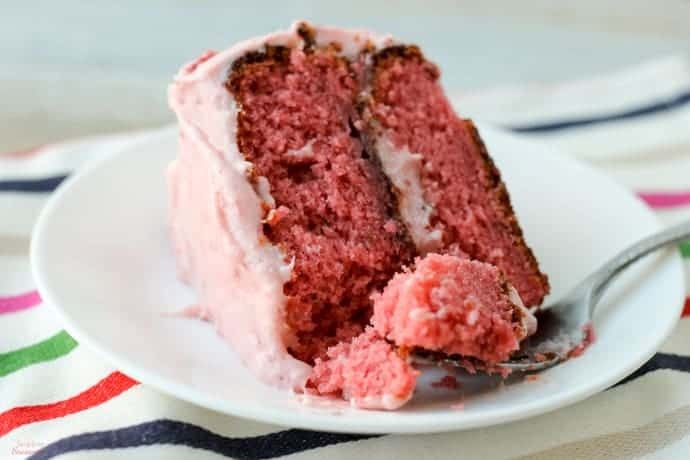 This easy Strawberry Cake is perfect for Valentine’s Day or Easter with its pretty pink color and fresh taste. 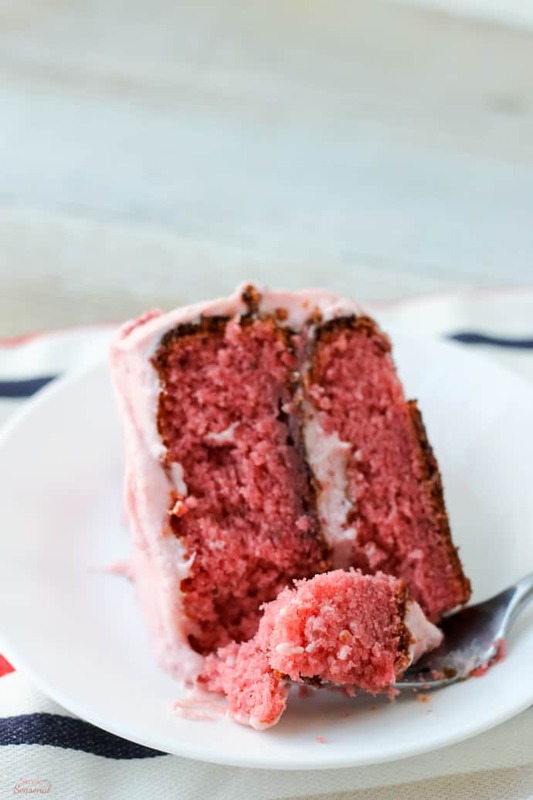 The frosting is homemade with fresh strawberries and it tastes like a strawberry milkshake! 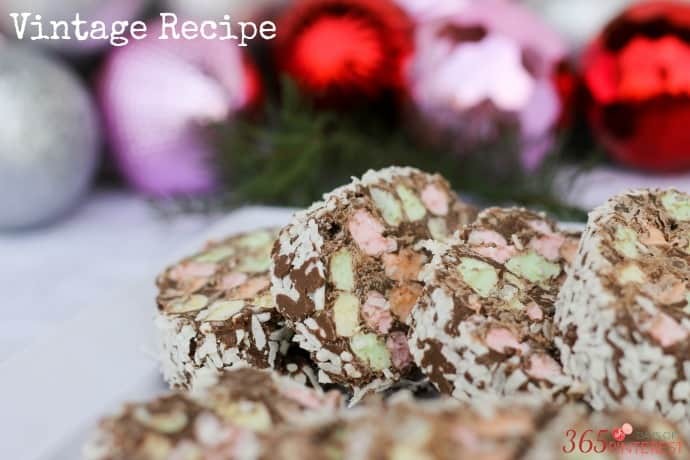 I first saw a similar recipe to this on Facebook, but the instructions were poorly written and unclear. 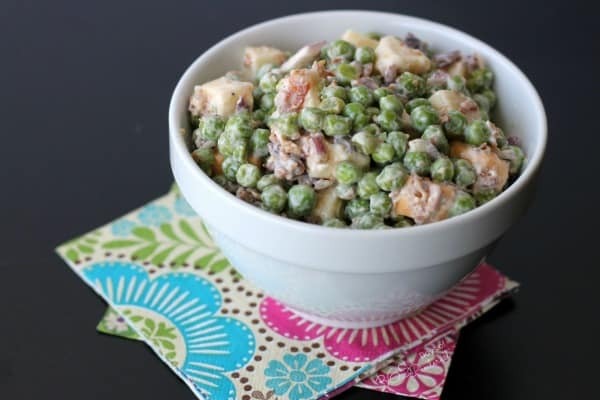 I went searching on Pinterest and found several other recipes that were almost the same thing. I used this one from Just a Pinch as a guide. I wanted to make mine as a layer cake instead of a sheet cake, so I tweaked the frosting recipe a bit so it wasn’t so runny. The overall result was delicious! Mix all the cake ingredients together in one bowl, and beat on medium/high for 2 minutes. Pour into two greased 9" cake pans. Bake at 350 for 30-35 minutes, or until sides pull away from the pan and a toothpick inserted in the center comes out clean. Set on racks to cool. Slowly add in the powdered sugar, one cup at a time. Beat until smooth. Mix in the strawberries until evenly distributed. Once the cake is cool, remove from pans and frost. 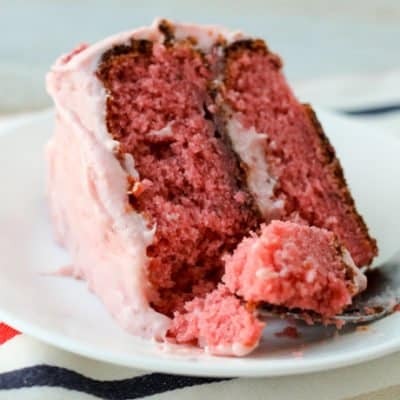 For a layer cake, add frosting in the middle and then on the top and sides. Refrigerate to set the frosting. Use fresh or frozen strawberries for this, depending on the season. You can find mashed strawberries already sweetened in the frozen food section of any grocery store. 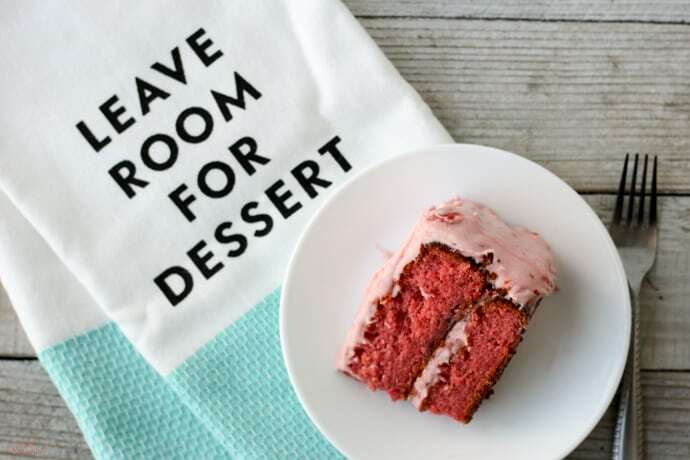 Use those for the cake, but not the frosting. 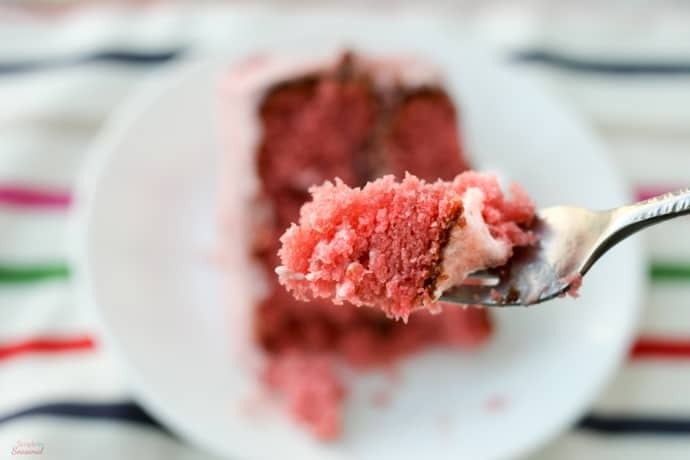 Buy regular frozen strawberries and mash them yourself for the frosting. Be sure to drain any excess water and juice! If using fresh strawberries, simply sprinkle a Tbsp or two of sugar over the strawberries and warm them in a saucepan to dissolve the sugar and make it easy to mash them. This is even easier as a sheet cake! Pour the batter in a 9x13 inch pan and frost when cool. Cooking time will be a few minutes longer. 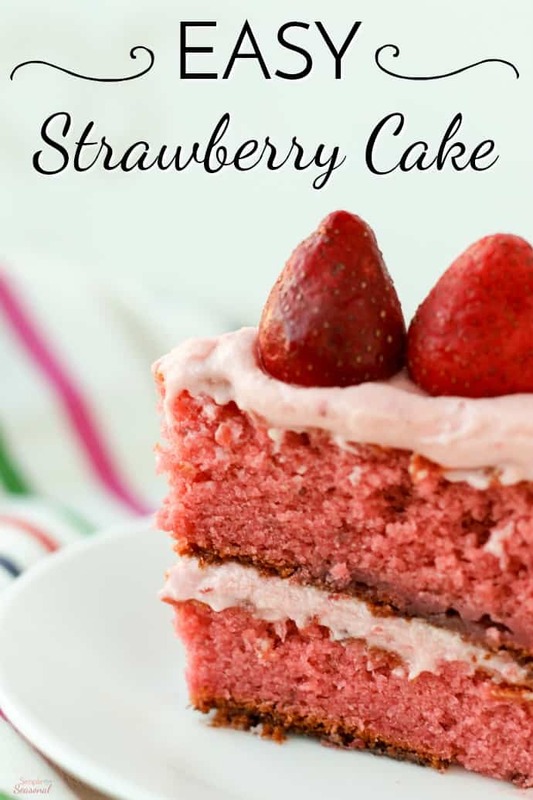 Vintage recipes like this Easy Strawberry Cake have always appealed to me. They remind me of church potlucks and Tupperware parties. I wouldn’t recommend eating like this all the time, but every once in a while it’s a fun treat. 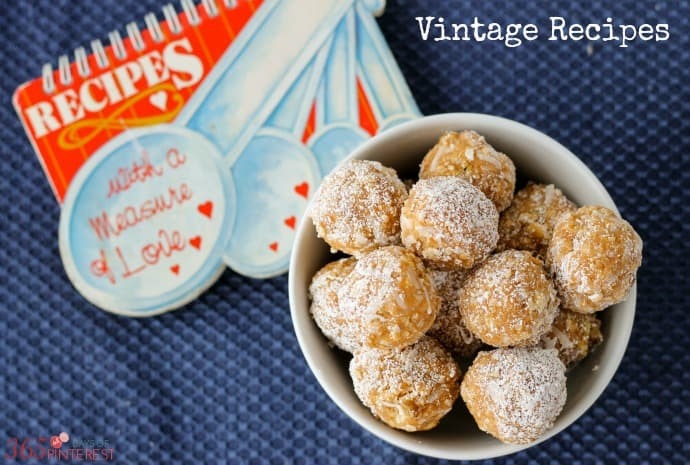 😉 Check out some of my other vintage recipes I’ve shared over the years!